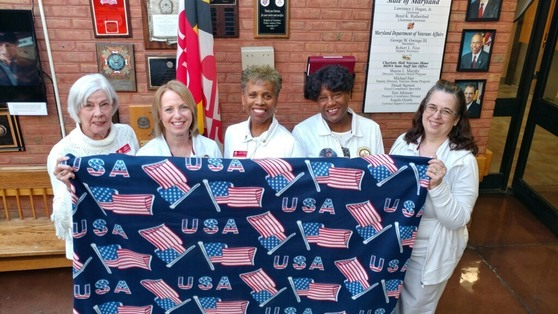 Gold Star Mothers Gina Barnhurst, Paula Davis, Janice Chance (President, Maryland Gold Star Mothers), Deirdre McMahon and Cindy Lowman visited Charlotte Hall Veterans Home recently and brought gifts for residents, including this patriotic fleece blanket. Memorial Day Observances will be held at MDVA locations around the state. Please see link below for more information on scheduled events at MDVA locations, including date and time. 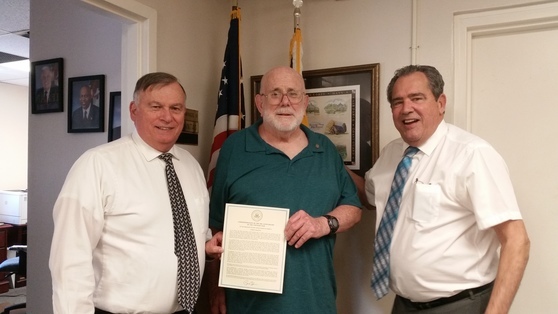 MDVA Deputy Director Bob Finn and Secretary George Owings, present Father David Russell (center) with the Vietnam Veteran Commemoration Pin and Certificate. Father Russell enlisted in the Navy directly from high school, and while enlisted was recommended for the United States Naval Academy. He graduated in 1968 and was Commissioned into the United States Marine Corps. He served in Vietnam, and was also stationed at the Norfolk Naval Shipyard and at Quantico. After leaving active duty service, Father Russell trained as a Catholic Priest in Buffalo, New York. Father Russell is now retired, but does assist, as needed at parishes in Anne Arundel County and Southern Maryland. 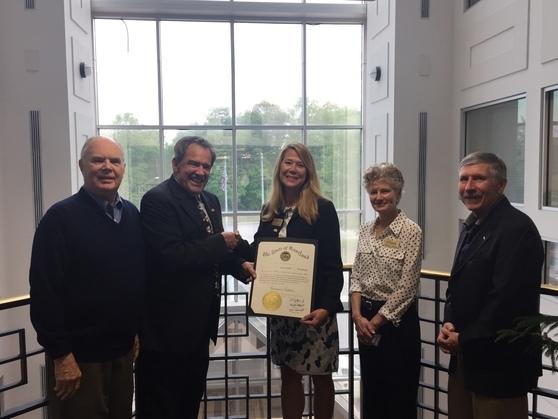 Ms. Lisa Terry (center), Manager of the Howard County Office of Veterans and Military Families, and Administrator for the Howard County Commission for Veterans and Military Families is presented with a Citation from Governor Larry Hogan for her dedicated service to Veterans, Active Duty Service Members and families. Also shown are from left to right: Major General Howard Mooney (USA, Retired), Co-Chair of Commission, MDVA Secretary George Owings, Captain Wanda Riddle (USN, retired), Co-Chair of Commission and Mr. Ed Hall, Commander of American Legion Post 156. In the 2017 Maryland legislative session, HB 1466 was unanimously passed in hopes of increasing the number of disabled veterans in state service. State personnel law now allows managers an alternative hiring process for Maryland’s veterans with 30% or greater service related disability. Hiring Our Heroes is looking for career-minded military spouses as well as veterans who have recently separated from service (no retirees) to take part in a new Corporate Fellowship Program. The program aligns spouses and veterans, based on their skills and experience with companies/organizations for 6 week paid fellowships where fellows gain hands on experience, and are able to network themselves into meaningful employment roles. If you are interested in learning more, please contact: egarcia@uschamber.com or go to http://www.hiringourheroes.org/fellowships for more information. TALMAR (Therapeutic Alternatives of Maryland) was pleased to celebrate its first veteran who graduated from our 10-month USDA aligned curriculum for Beginning Farmers, “Breaking New Ground." The course focuses on veterans who are reintegrating into civilian life by training them in an industry which largely parallels skills gained in military training. Many of these veterans have Post Traumatic Stress Disorder. Farming, with its rigorous schedule, physical activity and sense of purpose is a fit for many former military personnel. William Johnston received his diploma on Thursday, May 10, 2018 at TALMAR's non-profit farm in Parkville.